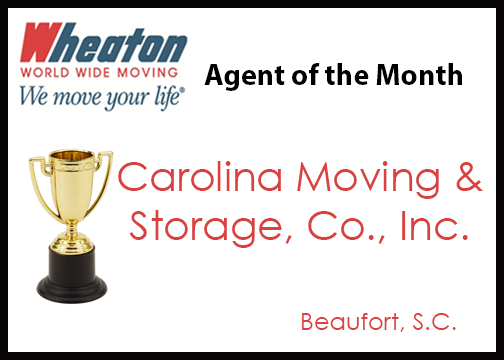 BEAUFORT, S.C. – Carolina Moving & Storage Co., Inc. is Wheaton World Wide Moving’s Agent of the Month for April 2017. The award is given to the interstate agent for Wheaton that exemplifies founder Earnest S. Wheaton’s philosophy of putting customers first and the characteristics of quality, professionalism, empathy for customers, fellow agents, drivers, and Wheaton employees. Carolina Moving has been family-owned and operated since its inception in 1959. Now in its second generation of ownership, Carolina Moving joined the Wheaton system in 2000. Carolina’s staff of movers and packers have more than 40 years of experience in the moving industry. The company handles all aspects of relocation from packing, loading, and transportation of household goods for individual residents and their families – both locally and long distance – to corporate relocation of employees for large corporations and military. Carolina Moving is well known throughout the area for their outstanding customer service. Carolina Moving maintains an A+ rating with the Better Business Bureau, and has earned the distinction of ProMover with the American Moving & Storage Association. Carolina has earned numerous quality, sales, and hauling awards throughout the years from Wheaton World Wide Moving. Carolina Moving is a member of Beaufort Regional Chamber of Commerce and South Carolina Movers Association. Carolina Moving operates from 40,000 square-feet of warehouse space and is located at 10 Neil Road, Beaufort, SC 29902. They can be reached at 843-524-5800, 800-299-9258, or online at www.carolinamovingstorage.com.